A woman clocks in for work at 9.00am, smartly dressed in black, hair worn back. She begins the task of arranging fifty chairs, slowly, methodically. Gradually she positions the chairs into neat formation – a regimented grid – before appearing to change her mind. The seating arrangement is disassembled and regrouped into a single long line, evenly spaced. Yet, before long this too is abandoned, seemingly deemed unfit for purpose, somehow not quite up to the job. The deliberation continues. New options are tested and rejected – over and over, again and again. At first glance perhaps, it could be possible to conceive of this lone individual as a diligent host, akin to the wedding planner intent on finding the perfect model of seating for accommodating the capricious whims of their nuptial guests. Or else, at times, she seems more like an over-zealous conference organizer maximizing the possibility of delegate interaction, willfully breaking up the larger social group into more intimate network hubs for optimal coffee-break dialogue. On occasion, her actions evoke those of the novice teacher, undecided how best to organize her class; somewhat uncertain where to place the chairs to keep the space dynamic, since every solution harbors a new problem needing to be solved. At first glance then, the woman’s gestures of assembly and disassembly might appear to have some utility, performed as part of the process of making ready, as preparation for some unspecified future event. Barely an hour in and the promise of utility appears questionable, a little suspect. At times, the arrangements appear determined, as though they were diagramming a specific scenario or had a plan in mind. But in other moments, the organization of the chairs becomes frustrated or distracted, sent off course – a touch wild. The identifiable configurations of chairs begin to offer moments of fleeting stability, which merely punctuate or interrupt the longer episodes of formlessness or of unruly, vertiginous disorder. In the absence of any named occasion to plan for, the configurations of chairs remain wholly speculative, hypothetical, abstracted. After two hours, there is still no prospect of resolution in sight; each reconfiguration seems to thwart the logic of the previous permutation, refusing to allow the possibility of any narrative to emerge. The different arrangements operate as propositions for potential, yet unfulfilled, relational interactions – imagined meetings or fictional gatherings – that are barely asserted before they become reconceived according to a different plan. The ebb and flow of action is maintained over the next eight hours – the duration of a typical working day – until 5.00pm, the time for quickly downing tools and clocking off. Nothing has been achieved, no conclusions have been gleaned, no resolution granted. Throughout the day, the unfolding event remains suspended at the level of the preliminary; the anticipated guests never arrive, their presence can only be imagined. Over time, the intent or purpose with which this task is performed appears increasingly foolhardy or misplaced, for the arrangement of the chairs lacks any sense of utilitarian purpose or design, any definitive function. Each configuration is disbanded before any chance of inhabitation, collapsed almost as soon as it is proposed. The task of assembling chairs is not preparatory; this is it. These are disposable structures, sketches; never intended for actual use. 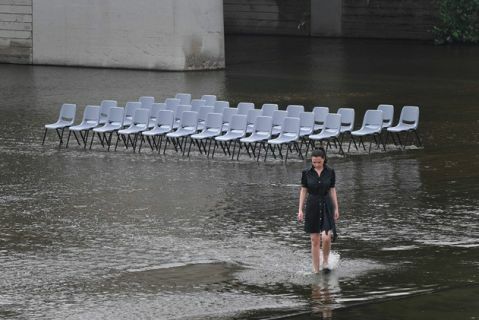 Whilst the various configurations evoke real possibilities for communication, the location of the action itself collapses all hope of functionality or utility, since the chairs are assembled in the shallow waters of the Los Angeles River, just under Fletcher Bridge in Elysian Valley. This is not a place wherein a briefing meeting might take shape, nor an exam or time-share seminar. It is not the place for a congregation; a reception; the patient formation of a seated queue; the first confessional of a self-help group; the gathered reunion of the class of 74’; a game of bingo; job interview or speed-date. Instead, this is This Here and That There, an uninterrupted eight-hour filmed performance by Vlatka Horvat. Previous iterations of this project have been performed in similarly incongruous sites: a large pool of water fronting the Haus der Kulturen der Welt (House of World Cultures) in Berlin (2007); an emptied urban plaza in Essen (2009), where even on dry land there remained a certain absurdity to the interminable rearrangement of chairs. This Here and That There extends Horvat’s concerns around the relationship between body and site, further questioning how an individual negotiates the specific terms of occupation and inhabitation within situations that appear limited or framed by absurd rules. Horvat’s work often takes the form of an attempt to find imaginative solutions within the terms of an illogical – curiously self-imposed – system or structure; where the artist-as-protagonist engages in various forms of endless action, irresolvable quest or repeated task, that seem inevitably doomed to fail. Many of Horvat’s projects operate according to a model of purposeless or even Sisyphean reiteration, in which a form of non-teleological performativity becomes activated in relentless obligation to private rule or order that is either absurd, arbitrary or somehow undeclared. In This Here and That There, Horvat’s perpetual assembly and disassembly of the chairs evokes the plight of Sisyphus, locked forever into the action of rolling a rock to the top of a hill, only for it to then roll back down again. Yet within Horvat’s work, the Sisyphean myth is conjured through the economic or diagrammatic vernacular of the instruction manual or informational guide; its cycle of failure and repetition explored as a playfully propositional as much as existential condition of lived experience. The failure of each repeated attempt to find the ‘right’ configuration of seating operates as the momentum for the work, the impetus for the development of new permutations and solutions to the task at hand. In this sense, Sisyphean labour becomes generative, where repetition always produces something new or different, the possibility of endlessly playful and mobile reinvention. The authority of the rule thus collapses in the wake of a performer who – like Sisyphus – refuses to buckle under its pressure, or who persistently endeavours to find new ways of creatively inhabiting the instruction through the performance of unlimited repetitions within its limited terms. The irresolution produced by the punctuated cycle of Sisyphean failure and repetition in the work prevents a sense of the inevitable disappointment experienced in the moment of completion. Horvat’s actions thus remain forever suspended at the point of anticipation, at the threshold of what is still yet-to-come; closure is traded in favour of endlessly unfolding permutations.